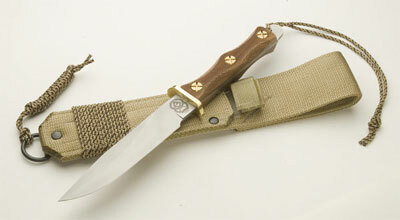 Another top-quality knife from the Ek Commando Knife Company. These knives are instant militaria collectibles. Ek Knife has been hand-making these knives for decades and have long had a reputation for making some of the highest-quality US Military combat knives. This Bowie knife features an extended clip for extra control. Use this choil to wrap your index finger around the blade's shoulder. The extra-long 6.75" blade is perfect for various, all-purpose uses. When paired with the Checkered Walnut grip, this knife is known as a CW5. When partnered with the standard Micarta grip, it's an M5. Typically includes the canvas protective sheath, as pictured, though when buying on eBay it's best to be sure.